From mummering and caroling, to winter lights festivals displays, to feasts and cookie-baking parties, Christmastime in Canada is full of fun and special traditions. You will delight in reading the 101 merry and heartwarming stories about family, goodwill, and holiday traditions across Canada's provinces. Remember, all our stories are Santa safe; so they can be enjoyed by the whole family. Chicken Soup for the Soul has done it again. I definitely enjoyed reading these short stories about the holidays. What I loved most was that the book was Santa safe, so even if my nine year old picked up the book, she wouldn't be disappointed in seeing any bad news. This is such a wonderful book to have on your coffee tables this time of the year. You could read a few stories on a rainy or snowy afternoon and still be able to spend the day with your family The length of these stories are great, especially when we want to spend time with our family during the holidays. Not only will this be a perfect read for you over the holidays, but this would make a great gift for just about anyone. There are just so many stories that make you smile and touch your heart. Disclosure: All opinions are my own. 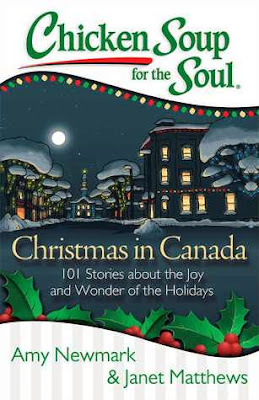 I received Chicken Soup for the Soul: Christmas in Canada at no cost for the purpose of this review. No other compensation was received.